couldn't agree more with this. At Newcastle Cycle campaign we have civil engineers, chartered surveyors, graphic designers and more. I recently got agreement from a Tory cabinet member for transport in North Tyneside that if we start putting forward detailed infrastructure ideas they will look at them. Money is tight but sometimes road resurfacing, regen plans and other local issues combine to make building something possible. If you don't have the ideas documented you'll miss the boat. Get out your colouring pens, graphics software or OS maps and get on with it. I agree with the sentiment. I put together a report, including photos, of the hazards to cyclists and pedestrians caused by cars parking within a mile of a hospital plus junctions where cyclists are bullied by speeding motorised traffic. I lobbied local councillors and presented the paper at a public meeting and there was ready acceptance of the need. The highways authority has found the budget for improvements. No Dutch style segregation unfortunately, but a series of measures that will reduce traffic speeds and flows, making the routes less dangerous for cyclists and pedestrians. My view is that we managed to get a foot in the door and a dialogue under way. We can use the language and processes of government (evaluations, reviews and reports) to influence further changes. Interestingly, within the local 'cycling lobby' there was dissent - one cycling champion argued that the money would be better spent on cycle training and funding led rides 'to promote safety in numbers'. Great post. In fact , following the Assembly vote, now would be a really good time for LCC to put forward a better plan for Blackfriars, on the Dutch model.. Regarding your dissenting cycling lobbyist: Such things as training, publicity and attention-raising events, and even, on a larger scale, subsidies such as the Cycle to Work scheme, are dangerous pitfalls. Every such activity could, in principle, be funded from another source. But government - local or national - is the monopoly provider of roads. Once public money earmarked for the promotion of cycling is diverted away from road infrastructure spending to such sidelines, it cannot be replaced from any other source. Really good post. Also worthwhile remembering that "new" money doesn't need to be found for creating great cycling infrastructure. There is already budget/money available for road maintenance / resurfacing etc. If the vision is there, then when roads are "maintained" they can also be re-designed. You are right in saying that we have to show them what really good infrastructure can look like. Poor facilities will not get people out of their cars and onto bikes. Great cycling facilities and safer roads will encourage those people who currently don't to give it a go. You just followed up one of my posts by saying that you think the man who said " just haven't got a clue about the sheer scale of the changes you need to make" might have been the author of this. This could have been the case. Clearly he had a good sense of what was required. 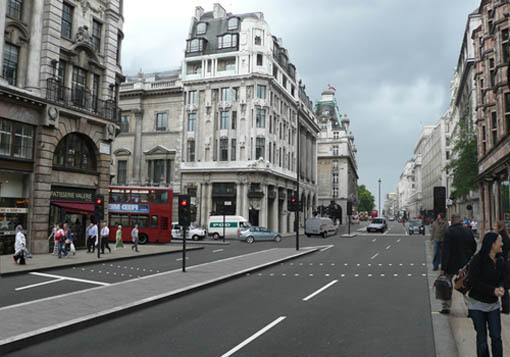 Not having a remote idea of the size of what needs to be done does appear to be a common thread in cycle campaigning, and amongst councillors and road designers in the UK.